Decorating your website with attracting colors has always been the first priority of a blogger. Uses like attractive designs they want to see things in an appropriate manner. In fact, those websites which has laboriously old appearance, finds it difficult to get any sorts of user engagement. This is the reason, why people always prefer Professional templates and themes for their website. Recently, one of our readers requested us on twitter whether she can use random background color every time someone reloads the page. 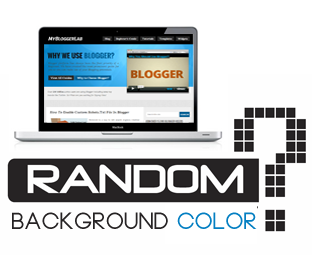 Therefore, today in this article, we will show you How to Randomize Background Color of your blog through jQuery in Blogger. Following is a rough screenshot of the request which we received from one of our reader via twitter. At first we thought it is quite impossible, but lastly we were able to pull it off so without any further due let’s directly get to our tutorial. Now, whenever you or someone else would navigate your site on every page they will notice different background color. The colors would keep on rotating automatically, until or unless you remove the script from the template. We hope this small but useful trick would help you in adding some extra spark to your blog. Every time you load it, you see a new design. Our team is currently working a script that could help you in rotating Image backgrounds every time someone reloads the page. Feel free to leave your suggestions by commenting below. wao thats good, will it make any effect on loading or anything else. it's nice trick syed, it means if i am using image as page background, it would not work? Cool Post . Faizan , just wanted you to know that your interview is live again . Plus I want to congratulate you on the new awesome design of your blog . You and your team are doing great . It would override your CSS. So, it would work on image background too. However, it is better to remove the image background. I don't think so, Its just a minor jQuery. this is a WOW post bro!